The festival is held in October every year and is well known as the "Harimichi no Abaredashi." 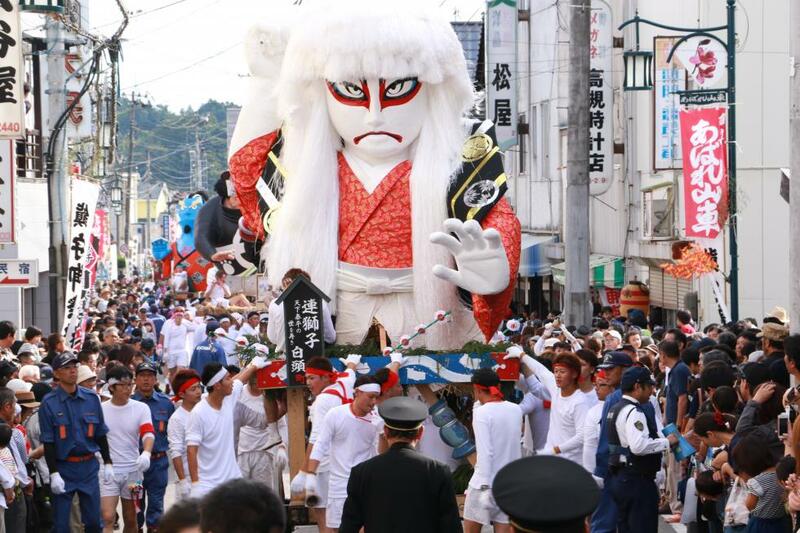 “Ujiko” of Suwa Shrine is divided into seven districts and the young men of those districts adorn floats with large dolls and, while the sound of tremendous drums roar, violently jostle (clash) with one another. It is an absolutely thrilling festival in which the floats clash and jostle with one another, roll over, and start the clash again. Tourists who gather from neighboring towns and villages enjoy that gallantry. It is a festival that is said to have continued up to today from 1585 and it boasts a tradition of over 400 years. The first accurate recording of this shrine's festival was from around 1740’s to the 1750's and, 1758 there were poor crops throughout the entire district and a major epidemic, the people at that time believed that the cause of this calamity was their failure for a long period of time to undertake the procession of the miniature shrine ("mikoshi") and they revived the mikoshi procession. At that time, they bought a wooden lion's head mask from Asaka-gun Ootsuki village (currently Koriyama Ootsuki-machi) and they began to perform kagura (sacred music and dancing). Around that time, floats decorated with dolls and the lion's dance was performed and this is said to be the beginning of the "abaredashi." Later, in 1772 traditional Shinto style curtain and a set of doll making tools were donated to three shrines, but, due to the famine of 1782 to 1788 the festival was halted for some time and at long last the festival was revived on a large scale in 1788. Together with stalls beautifully decorated with dolls, it is said that in 1790 “niwaka”, an impromptu"kyogen" play, was performed. In the past the festival was held from July 27 to 29, but from 1926 the festival was held from October 6 to 8 and later from October 8 to 10. Currently, it is held for three days until the day before Health and Sports Day, and the clash of the floats visited by tourists will be held on the last Sunday.